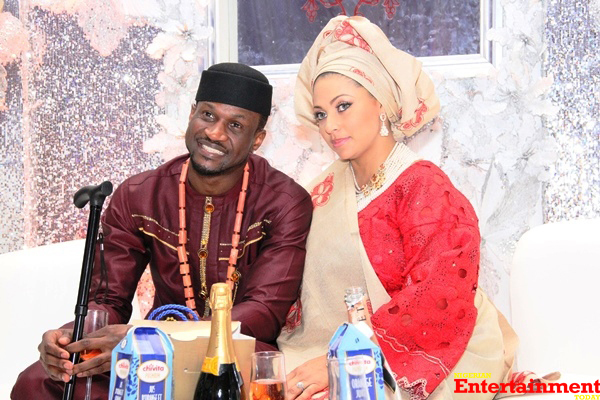 Peter Okoye’s Family Didn’t Support Wedding To Lola Omotayo, DNA Test Demanded For Children? Hmmmmm my people things dey happen o. Do you guys know that Jude Okoye, the elder brother of P-Square’s duo (Peter & Paul Okoye) didn’t attend the traditional wedding ceremony of Peter Okoye to Lola Omotayo? A source who wrote to us this morning authoritatively confirmed that Jude Okoye was not in Ghana as PSquare publicist said. Even sources who attended Glo Slide and bounce concert in Ghana said Jude Okoye didn’t follow the twins to Ghana. Apparently Jude was in Lagos throughout the wedding. He wasn’t in any studio session with Wizkid as some suggested. The source said his no show for the wedding is another confirmation that Peter Okoye’s wedding to Lola Omotayo was not supported by his family. The source further said even their late mother, Mrs Josephine Okoye didn’t support the relationship from day one. According to another reliable insider, Lola Omotayo was perceived as a wayward woman by Peter Okoye’s family. At a point in their relationship sometimes this year, we learnt some key elders in the Okoye’s family requested for DNA test to ascertain the paternity of Lola Omotayo’s children. They accuse her of sleeping around with people she call her uncle…… Na wa o…. But wait a minute, why is this happening now? Why can’t people just allow the newly married couple to rest. Whether they love Lola or not, all that matters is that Peter Okoye has made his decision. Please folks should let this couple be o. No marriage is never without an issue. Wishing Lola and Peter a blissful marriage.